Full weekend, overnight stay Saturday. These two-day events are designed for those currently learning Japanese, as well as those interested in learning the language, to immerse themselves in Japanese language and culture at IPU New Zealand. 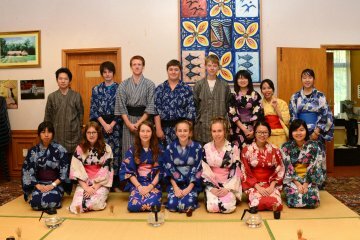 Participants will attend Japanese culture and language classes taught by IPU New Zealand's three native Japanese lecturers, try out several Japanese cultural activities, and interact with Japanese students to improve vocabulary, intercultural communication skills, and confidence! These two-day events are also an opportunity for students to experience student life on campus at IPU New Zealand. Students will get a taste of the courses we offer in TESOL, International Business, International Relations, Japanese Studies, Environmental Studies and Ecotourism, as well as interacting with current students to experience student life through IPU New Zealand's clubs, events, and facilities. Overnight stay on Friday and Sunday, as well as transport subsidies are also available for those travelling from afar. See footage from previous Japanese Intensive Weekends here. Contact our team at nzinfo@ipu.ac.nz for more details. Secondary school Careers Advisors and teachers are welcomed to visit our campus to experience firsthand what we offer in terms of study programmes, students support, and career pathways. Travel subsidies may be available. Contact Joe Rush for more information or to register. IPU New Zealand will be present at the following 2015 expos in New Zealand. Come and meet Joe Rush, our Schools' Liaison Officer, at the IPU New Zealand display. Joe, and Ethan our Schools' Liaison team, will be visiting secondary schools throughout NZ during the 2016 school year. You are always welcome on campus for a tour and to meet with relevant staff. Where possible, please contact us first to ensure staff members are available. We welcome individuals, small groups, and larger school groups. Contact Joe Rush for more details.